During the last week of my winter vacation, I've been participating in a week-long, mini-internship at the Philadelphia Art Alliance, a contemporary craft and design museum located in Rittenhouse Square. I had the unbelievable good fortune to be put in touch with William Daley, the artist who is the subject of the PAA's upcoming exhibit, “14 for 7”. 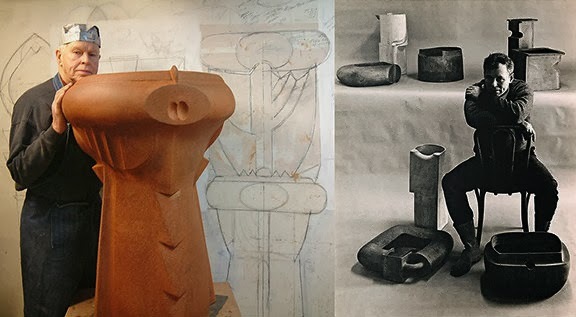 The exhibit, which opens January 23 and runs until March 9, focuses on 14 of Daley's ceramic works over his 7-decade career and ties in with William Daley: Ceramic Artist, a new book about his life and work. This piece was published on the PAA blog and can be found here. 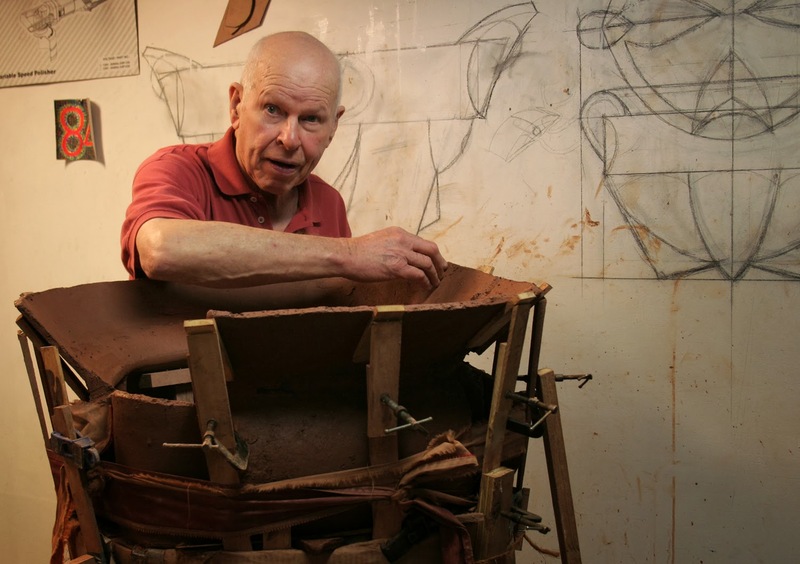 Bill Daley is a distinguished ceramicist and beloved teacher who has been creating vessels for years. 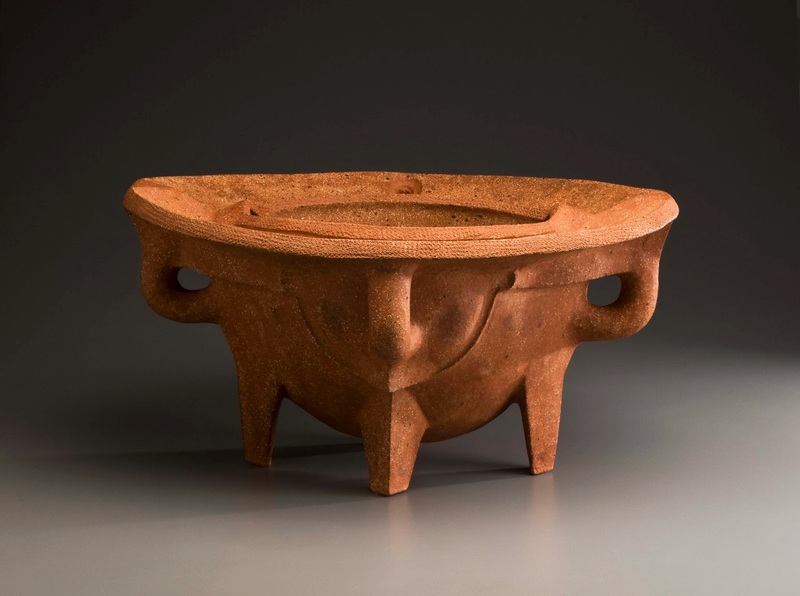 His works are often large and richly textured, imbued with symbolic meaning and allusions to the functions such vessels have served over the course of time. He has exhibited at and been collected by institutions such as the Los Angeles County Museum of Art, the Philadelphia Museum of Art, and the Metropolitan Museum of Art. I spoke with the artist on the phone, where he took a break from working in his Philadelphia-area studio to answer my questions. Over the phone, the 88-year old Bill was self-effacing and deeply philosophical in equal measure. Enjoy! I On the Arts: For my first question: can you talk about how “14 for 7”, your upcoming show at the Philadelphia Art Alliance, came about? Bill Daley: Well, my children just made a book for me, William Daley: Ceramic Artist, and we presented the book in Chicago at a book signing and so on, but after the book was about to be hatched, we contacted the Art Alliance. I had a show there in ’68 and was in group shows before that, and they offered to show some work at the Art Alliance and have a book signing. So that was sort of the core for the beginning of it. We decided that it had to be small; I had a large retrospective at Swarthmore about five years ago, and that had maybe 20, 25 pots in it. So we thought all we could get—that would be presented well in the Art Alliance downstairs—was fourteen or fifteen pots. So with seven decades of work, we picked two pots for each decade and came up with “14 for 7”. 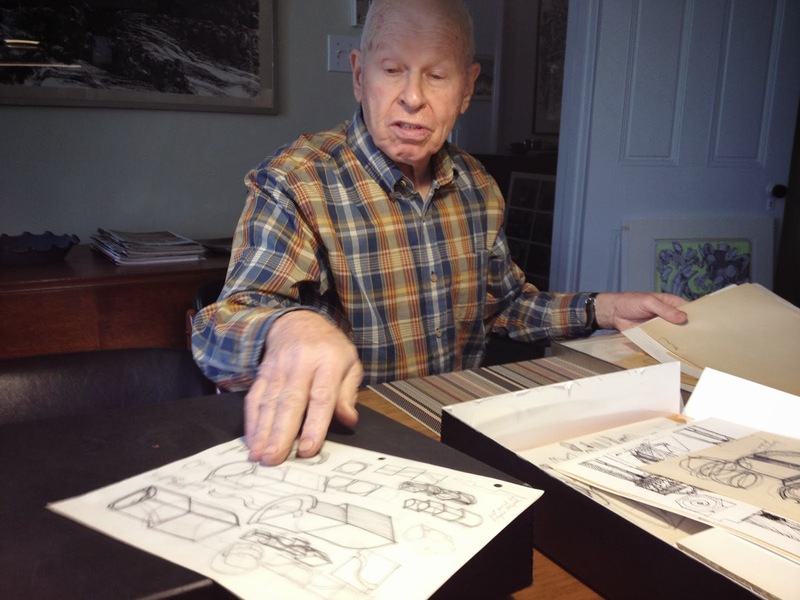 The artist in his studio, present (c. 2008-2010) and past (1969). IOtA: So, going back a little bit: What is your artistic background and your training? What was that like? IOtA: That’s quite a range of experiences! BD: (laughing) Well, I kept always moving. One time I quit in protest because they thought we were all Communists! Because [they] thought modern art was subversive… but anyway, the rest of the times I changed because I needed a change, or there was a better opportunity. William Daley, Joy-full Libation Vesica, 2010. IOtA: Where did you quit from, if I may ask? BD: Well, they didn’t actually accuse us. It was in Ulster County, New York, which is a very conservative county, and they just were not used to having contemporary artists in the art department at New Paltz. So they were really pretty upset by it, and we were a bunch of radicals. They fired—they relieved—two-thirds of the faculty of their positions and two of us resisted and quit. And we didn’t get any support from the college at large so I began my career at the Museum School of Art. I got a job there, and it was really a great boon that I had quit, ’cause the Philadelphia experience has been at the core of my experience since, and that’s been great. And it’s still great, because this is my second show at the Art Alliance. In ’68 I had the first show by the Philadelphia Council of Professional Craftsmen, of which I was a member, and they gave me the first show that they gave an earnest, worthy worker, I guess, to exhibit. And so I had a show there in ’68. BD: Well, you go ahead… you can cut it down to three sentences if you want (laughs). Okay, what else are you curious about? IOtA: Let’s see… so, how did you choose your medium? BD: Well, when I started out I wanted to be a painter. And I was pretty successful as a veteran, a novitiate painter, and I had work in the Institute of Contemporary Art, which had just begun in Boston. Anyway, I took a ceramic class and I [had] liked clay when I was in high school, but I was so taken with this new teacher and I was smitten by the medium, and I just knew that that was it, although I was pretty bad at it. So that’s how I chose it—it chose me! So I’ve been morphing clay ever since, but I’ve had shows in bronze casting and sheet metal work and wood and so on. … That’s how I got started with being seduced by mud. It’s a great medium. It’s the most primal, metamorphic material because it changes from rock, to dust, to mud, to something you can form, and then [it] dries out and you bake it or you fire it, and it turns back into stone. So it moves a whole cycle of what material can become. It’s a marvelous material. It’s also very seductive to use—it just feels great and slippery and all of it. It’s great stuff. I recommend it. BD: Well, I sort of have had a very broad influence. When I grew up outside of New York City, went to high school, went to the Museum of Modern Art. I was very impressed by Archipenko and other artists in many, many media. So I think I had a rather broad idea of what it might be about, even when I was in the service. And when I was in the service, I read a book that was a very influential one about the philosophy of art. It was Durant’s book on the philosophy of art. And it was Coomaraswamy who chose all the work at the Asian Collection Center in the Museum of Fine Arts, Boston. He was the collector for it. And he wrote on the history of art and the aesthetics of ceramics very beautifully, and that was very persuasive to me. The artist in his studio, c. 2008. So those are the literary things, and I also was very influenced by Chinese Shang Dynasty bronzes… these bronzes were ritual vessels for burial and they and they were very exciting. And if you look at them… every symbol and curve has a symbolic, metaphysical meaning. So that got me interested in making pots that were not just about use, but about meanings that were more ritual in some sense, that were about spirit. So I really came to the point where I believed that the form of a pot and its expressive possibilities were what were important. I’ve always approached making ceramic vessels as not about just function, but about metaphysical function, if that makes sense to you. I think in some ways, it’s one of the things that separates me from the people who are making useful things. But mine are useful too, but not in the physical sense. And I have pots in museums all around the world at this point, which is nice. And I’ve evolved a bunch of techniques that are sort of, like, “do it yourself” simple ways to do things differently, so you can make big pots by yourself, without assistance. That’s been very useful to me in my home studio, which I’ve [had] for the past fifty years. My studio’s in the cellar, and it’s a magical place for me. In fact, that’s where I was when you called. And the last pot that’s going to be in the show is being completed as we speak (laughs). BD: Whatever that means. I guess you might as well admit as long as you know you’re not one… But I’m pretty convinced, at 88, that I’m a persuasive artist, which is nice. I’m grateful. IOtA: How have your relationship with art and your journey as an artist changed over the course of your career? I don’t know if I’m repeating myself, but my interest has been of such long duration that my changes have been mostly going as kind of a spiral. It’s not a circle where you repeat and go around and around, it’s as you graduate… there’s a marvelous educator named Jerome Bruner, an educational psychologist, [who] talks about education for the left hand, the other way of knowing, the intuitive way. There’s a great book by a guy named Benedetto Croce called Aesthetics that says that intuition is the highest form of knowledge, not information or conceptual [didacticism]. So I’ve really been prone to be persuaded by people who feel that the unknown is still largely unknown, and we can find it by working material, and my material is clay. So I guess that’s some part of the core that keeps me revved up, that I’m always finding the boundary of finding out things… they’re are moving to me, and they’re moving to other people because they’ve sought my work out over time and wanted to have it in their lives. So art’s not complete until it completes a cycle. You have the maker, and the made, the object or thing, the offering, and then you have the audience. You have persons you are communicating with. So the artist is in community—the idea of the romantic artist in the attic… is a romantic misunderstanding. Artists are really [some] of the persons in the community that get some of the signals about what’s important, just as early as the scientists and philosophers and so on. And I’m not saying artists as in always physical artists; I think poets and singers and instrumentalists… the whole thing is all the same. Different form, but totally about giving form to the ineffable. It sounds pompous as can be, but I find it very compelling. IOtA: This last question that I’m going to ask is what I always conclude interviews with. What do you hope people who see your work take away from it? BD: That’s a good question! Well, what I would like them to do is to experience it, and I know that sounds corny, but I would like them to touch it. I would like them to respond to its form by… I’ll call it caressing it or searching it out with their eyes closed. I’d like them to understand that it’s about the inside of the inside of things, and it’s about the outside of the outside of things. In other words, I’d like them to use what they feel and touch and see and sense to imagine things that call up experience in their own being that permit them to tune it on it. So I do a lot of different things with different textures and different roughness, I [do] bumps and holes. I’m interested about open spaces, I’m interested in intimate, closed spaces, I’m interested in transitions from wonderful—like you were sliding down a hill in a sled or down a canyon or into a whirl, into a helix… I think of it almost as psychic physicality that I would like people to have about it. And as they wonder about it, they can wonder if it’s a palace or a temple… or a monument. I give them all names and that’s a little kind of clue to what they might be about. Right now, I’m making cisterns. A cistern is a vessel that holds some substance for either ritual or for preserving life. That’s either water, or holy water, or rain, or wine… so I’m making cisterns that are for libations and for… symbolic conservation. You can put them in your yard, or you can fill them with things for a party. And I’m having a great time doing it. But I’ve made hanging planters and baptismal fonts and many different kinds of vessels or containers for evoking feelings about being a human being… and my pots about body parts. I’m not a literal artist… I make objects that are about feelings. And I see feelings as touch, and I see it as touching your mind, and I see it as touching your whole spirit, about experience you’ve had to the present when you come to this object. "William Daley: 14 for 7" runs from January 23-March 9. The Philadelphia Art Alliance is located at 251 S 18th St, Philadelphia, PA 19103. It is closed on Mondays.